Trickbox TV Launches State-of-the-Art Live Streaming Webcasting Platform. London, March 2018: Trickbox TV, a leading supplier of equipment and services for studio and location multi-camera productions for broadcast, video production, webcasting and live events, has announced the launch of its live streaming webcasting platform, TrickboxLive. 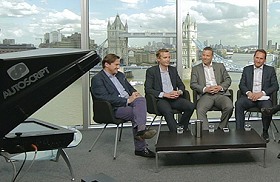 A managed hybrid event service, TrickboxLive provides professional live streaming of high-quality panel discussions from Trickbox TV's central London HD TV Studios, or from a venue of the client’s choice. TrickboxLive allows users of the platform to include both online pre-registered participants and a live studio audience from the business community. The panel of industry experts discuss key issues moderated by a professional broadcast presenter or presenter chosen by the client, who maintains a fast paced and engaging conversation - akin to a talk show - between both the panellists and the audience who watch and participate via their mobile or desktop. Participants use TrickboxLive's sophisticated video and audio applications to vote in polls, submit questions and interact via social media channels. As well as delivering a lively interactive debate with broadcast quality streaming, the company hosting the session also captures advanced data analytics and programmatic and rich media advertising.